The exterior of a Whitehall home built through the National Affordable Housing Network is partially warmed by solar panels on the garage roof. 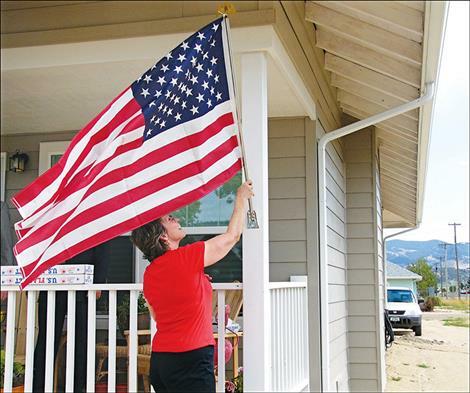 The owner of a newly-finished home in an affordable housing project in Boulder raises the flag on dedication day. Calling the blocks of closely placed pre-1976 mobile homes “a ticking time bomb,” Boulder Fire Chief Shane Maichel said the entire area could easily have gone up in flames, jeopardizing lives. It took five area fire departments to keep that from happening. Denise Lagenvall told the city council she lived in a 1964 trailer within 30 feet of her neighbor. “I own the trailer. I don’t own the land,” she said. “According to your new rules, I’m going to be homeless in five years,” she added. “It’s going to affect a lot of people that cannot just pick up and change…It’s going to hurt this community,” area resident Wanda Stout told city officials. Other mobile home occupants told the council they had no real options. They simply could not afford other available housing in town, they said. According to “White Paper: Housing in Montana,” a 2012 publication of the Montana Department of Commerce, the average income in Jefferson County fell about $45,000-$50,000 short of the single family home median purchase price. The average elementary school teacher could not afford the median purchase price, nor could a retail salesperson, said the report. In Boulder, that was after construction of a five-home affordable housing project in 2008-9 and redevelopment of 36 low-income apartments. Public comment after the fire made it clear affordable housing was still inadequate despite those projects. The city revised its regulations to bar mobile homes more than 20 years old from entering town. The adopted ordinance also increased separation between the structures. Many in town acknowledged that it was kicking the can down the road, but voiced frustration over options. “If we could go in as a city and say, ‘We’ll make it work so you don’t have to lose your home,’ while still doing away with the unsafe housing, that would be best,” said Maichel, the fire chief and a city council member. Finding options for creating affordable housing is a challenge far from unique to Boulder. Two years ago, Becky Robinson, a bank teller in Ennis for nearly a decade, was living in an uninsulated pre-1976 rented trailer, unable to afford a home even though she had worked all of her adult life. “Everything was either so expensive I couldn’t afford it or so old you’d have to tear it down and start again,” she said. Nationwide, the percent of owner-occupied households paying 30 percent or more for housing went from 21 percent in 2000 to 25.9 percent in 2010, according to the Housing Coordinating. “Living in a rental, owning a home, living on the street or living in a shelter determines to a large extent a person’s health, sense of well-being, family security and lifelong wealth prospects. How a community houses its population is also fundamental to the character of the community, affecting crime rates, health costs, physical layout and land use, local government taxes and expenditures, and attractiveness for business and economic growth among other things,” said the 2012 White Paper. It also warned that the problem is likely to grow larger with the graying of Montana. “As Montana’s population ages, more housing units will be needed to house the same number of people as the share of one and two person households increases relative to the share of family households with children,” said the report. For Betsy Robinson, a bank teller living in a drafty mobile home in Ennis, the answer to her housing dilemma came as part of an affordable housing project in Whitehall guided by the National Affordable Housing Network (NAHN). That non-profit organization has spent more than 20 years helping Montanans achieve homeownership through a self-help housing program. In Ennis, the wind howled through Robinson’s trailer walls, leading to a monthly heating bill averaging $135 a month. Now the dollars on the heating bills can be counted on her fingers, thanks to the quality insulation and energy features of the new home she helped build. Barbara Miller, co-founder of NAHN, said the new homes have lots of energy-saving features that cut down on costs. When all is said and done, “essentially their power bills go away except for the hookup,” she added. Miller said she believes speculators, knowing that Montana has been “discovered,” are buying homes and holding them for higher prices. Part-time Montana residents are also a factor in the growing need for affordable housing. “A lot of the supply has been vacuumed off to people that don’t live here,” she said. A similar NAHN project is in the works in Boulder, where the high school superintendent said lack of affordable housing means a valued teacher has found it necessary to live in a single-wide trailer with his family of three. There has to be a better option, he said, adding he would encourage the teacher to apply for one of four NAHN houses that may be built next summer. Miller said Jefferson County individuals can be eligible for the program if they make less than $44,400 annually. The income threshold, based on 60 percent of the average household income in the county, rises to $50,750 for two persons, $57,100 for three and up to $83,750 for families of eight. NAHN, like many of the non-profits working in the state, puts together funding packages that rely on a variety of federal programs in addition to private donations. The group also provides credit counseling to help families get control of their debts so they can qualify. Information on NAHN, can be found online at nahn.com. Other similar non-profits working around the state can be found through the Montana Department of Commerce Housing Division at housing.mt.gov. Red Lodge, facing a trailer court situation very similar to the one in Boulder, forged the way on a new approach beginning about a decade ago. A developer purchased the trailer court, which had commercial frontage on the main highway through town as well. Betsy Scanlin, a city council member who became mayor by the time the project was completed, worked with others to arrange for the residents of the trailer park to get federal financing and purchase the ground less the commercial frontage. “By golly if they didn’t step up and join in on it,” Scanlin said of the residents. Under the arrangement, used in Red Lodge for the first time in Montana, the residents formed a cooperative to which they paid a membership fee and down payment on the property. The coop then took out a low interest loan on the ground. The residents have the right to sell their homes but not the land, similar to a condo arrangement. Because the association does not need to make a profit like a private business owner would, they can agree only to raise what they need for improvements. The new resident owners have been able to put in all brand new water and sewer lines, curbs, gutters and pavement, Scanlin said recently. They have also been able to upgrade their homes, saving on heating costs that were “going out the ceiling,” said Scanlin. Instead of paying $200+ per month for heat, it can go toward mortgages, she said. “It’s a real success story for service workers, and I am so proud of them,” she said. Saying a community is stronger economically with a “diversity of housing stock,” she said the resident owners have also become taxpaying homeowners. The model has since been followed in other Montana communities, including Missoula, Kalispell and Great Falls. A non-profit organization called NeighborWorks, online at nwmt.org, assists communities through such projects. Another Red Lodge woman who worked with Scanlin on the resident-owned trailer court project is now associated with an alternative program that puts the land ownership in a trust. Jo Ann Eder has joined others at Trust Montana, a non-profit devised to address a problem with some affordable housing programs. She credits Scanlin with raising the idea of acommunity land trust. Programs such as Habitat for Humanity are great for the people who help build and thenoccupy the home, she said recently. But when that owner decides to sell the home, it goes on the open market, “and many times they take the money and move out of the community.” With the land under the home rising in value, especially in fast-growing communities, what was once affordable housing quickly becomes less affordable, “and there you go again,” said Eder. Trust Montana, which bills itself as “A Conspiracy of Goodwill,” assists communities with setting up a community land trust overseen by a non-profit corporation to facilitate affordable housing, among other uses. Under the program, residents on the trust land own the buildings and other improvements created by their labor and investment but do not own the land itself. Eder said that model is used in other locations, but “there are very few states that do it as a statewide program.” Due to Montana’s low population, however, a statewide program seemed most useful, she said. Resale agreements on the buildings exclude the land value and limit the profits the seller can make, said Eder. “It doesn’t keep them from making a profit, but it helps keep the housing affordable,” she said. A pilot project for the Trust Montana affordable housing effort will be done soon in Red Lodge, said Eder. Montana has virtually no state funding for affordable housing, said Montana Board of Housing Commissioner Sheila Rice. Forty-seven of the nation’s 50 states – all but Alaska, Mississippi and Wyoming – have housing trust funds. Of those 47, all but four have dedicated funding from state sources, usually real estate transfer taxes or documentary stamp taxes. Montana is one of the four which uses only federal pass through funding and private donations. The fund was created in 1999 by the Montana Legislature and funded by the 2001 Legislature with $3.9 million in federal pass throughs, but a special session in August 2002 cut that pass through amount to $1.2 million. In early 2017, the state’s trust fund board announced that $3 million in federal funds were available. Having no state funding limits what can be done, said Rice. Montana could set aside investment funds from the coal tax trust, she suggested, to provide low interest loans to developers. “It would make a huge difference,” she said. Residents of manufactured home communities, what used to be called trailer parks, are often under stress, said Rice. “They are very vulnerable to rent increases, deferred maintenance or, worst of all, closure,” she said. People tend to disrespect people who live in substandard housing, “but they are hard workers,” said Scanlin. Making sure they have access to healthy, affordable housing can keep them in the community, filling essential jobs and lifting businesses, she said. Eder said affordable housing projects can also help the community’s youth, allowing them to train in the building trades. The Red Lodge project, the start of “resident owned communities,” led to “pride of ownership” for the residents, she said. “It’s a beautiful place,” she added. Miller said the biggest dividends from an affordable housing project may accrue to the children who grow up in the homes. They have a better chance at being healthy, confident, and more reliable students, as well as taking pride in where they come from, she said.